Sixty-six teams from Southern California, Hawaii, Colombia and Chile competed in the Los Angeles regional FIRST (For Inspiration and Recognition of Science and Technology) Robotics Competition on March 13 and 14. NASA's Jet Propulsion Laboratory, Pasadena, California, sponsored seven teams in this annual engineering and technology contest, which was held at the Long Beach Convention Center. Winning teams for the overall regional competition were from Hope Chapel Academy, Hermosa Beach, California; Atascadero High School and Beverly Hills High School. Hawthorne High School received the competition's highest honor, the Regional Chairman's Award. This year's challenge, "Recycle Rush" was a recycling-themed game played by two alliances of three robots each. Robots score points by stacking totes on scoring platforms, capping those stacks with recycling containers, and properly disposing of pool noodles, representing litter. In keeping with the recycling theme of the game, all game pieces used are reusable or recyclable by teams in their home locations or by FIRST at the end of the season. Working with adult mentors, students have six weeks to design, build, program and test their robots to meet the season's engineering challenge. The teams then participate in one or more of 105 regional and district events that measure the effectiveness of each robot, the power of collaboration and the determination of students. The participants are vying to compete in the FIRST Championship to be held April 22-25 in St. Louis, Missouri. FIRST is part of NASA's Robotics Alliance Project, which aims to expand the number of robotics systems experts available to NASA. Arcadia High School triumphed at the National Science Bowl regional competition at NASA's Jet Propulsion Laboratory in Pasadena, California. The event was held Jan. 31. The team, consisting of four main players, an alternate and a coach, reigned supreme against 23 other teams from Southern California. Team members earned a trip to the National Science Bowl finals in Washington, which will be held April 30 through May 4. The format of the competition resembled a fast-paced game show, with students buzzing in to answer questions at the college freshman level. They were not permitted to use calculators or notes. The questions spanned various topics in Earth and space sciences, including astronomy, biology, chemistry, physics and math. Contestants at JPL proved themselves quick-witted in a wide range of questions - for instance, knowing that 1,600 + 81 makes a perfect square. Many people in the audience were awed whenever students buzzed in with correct answers before the announcer had finished asking the question. The second-place team, from Dos Pueblos High School in Goleta, gave the Arcadia team a suspenseful challenge as the competition neared its end. The two teams tied at 82 points at one point, resulting in a tiebreaker that Dos Pueblos won. But Arcadia made a comeback in the very last match. Santa Monica High School placed third. All members of the Arcadia team are high school seniors, and all said that they want to pursue mathematics, science or computer science in college. One team member, Chris Chi, already works in a biology lab. "We all do a lot of science in our spare time," said Kevin Wang, captain of the Arcadia team. 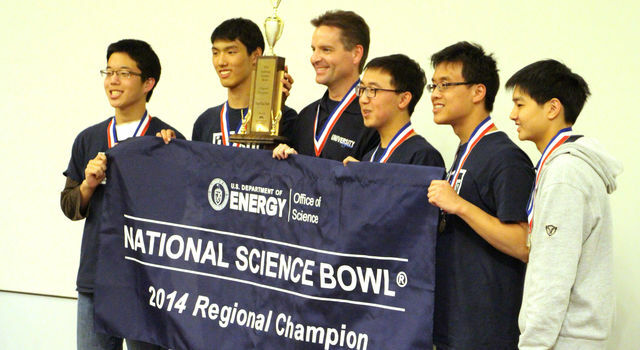 The National Science Bowl is designed to inspire students to pursue careers in science or math. Over the 24-year history of the competition, about 240,000 students have participated. JPL, managed for NASA by the California Institute of Technology, has hosted the regional Science Bowl for 23 years. 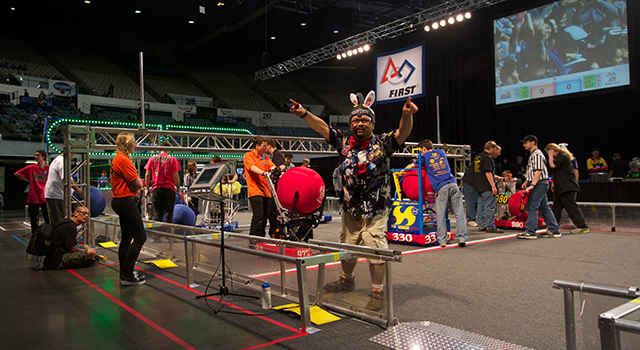 Soaring strains of the American and Chilean national anthems kicked off the 2014 FIRST (For Inspiration and Recognition of Science and Technology) Robotics Competition Los Angeles Regional Qualifier. Cheers from students of both nations erupted during the event's closing ceremonies, when it was revealed they would move on in competition. NASA's Jet Propulsion Laboratory, Pasadena, Calif., sponsored 10 teams from Southern California at this competition as part of NASA's Robotics Alliance Project. JPL also oversaw volunteer coordination for the event and provided 30 volunteer workers, including judges, referees, field re-setter and game announcer. 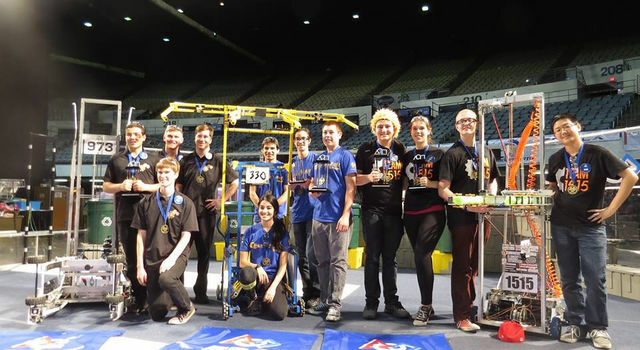 All 66 high school robotics teams competing in the L.A. qualifier, held March 21 and 22 at the Long Beach Arena in Long Beach, Calif., were vying for spots at the FIRST Robotics Competition World Championships to be held in St. Louis, April 23-26. - Team 3309, Friarbots--Servite, Connelly and Rosary high schools, Anaheim, Calif.
- Team 4997, The Golden Machine--Long Beach Polytechnic and Woodrow Wilson High School, Long Beach, Calif.
- Team 1717, D'Penguineers--Dos Pueblos High School Engineering Academy, Goleta, Calif.
- Team 5124, West Torrance Robotics--West Torrance High School, Torrance, Calif.
- Team 294, Beach Cities Robotics--Redondo Union and Mira Costa High Schools, Redondo Beach, Calif. The 2014 challenge, "Aerial Assist," is played between two alliances of three teams each. Each alliance tries to score as many balls in goals as possible during a two-minute-and-30-second match. Additional points are earned by robots working together to score goals, and by throwing and catching balls over a truss suspended just over five feet above the floor as they move the ball down the field. 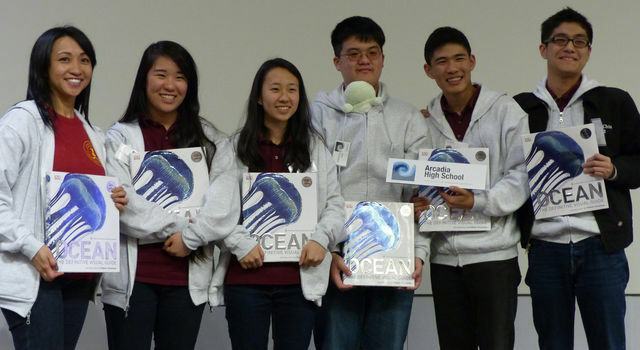 They came from all over the Golden State, from San Francisco to San Dimas -- 24 teams of five students -- to compete in the 15th annual JPL-sponsored regional Ocean Sciences Bowl, a "Jeopardy"-style competition. The event was held over 13 hours on Saturday, March 15, at NASA's Jet Propulsion Laboratory in Pasadena, Calif. The round robin-style "Surf Bowl" featured multiple choice questions and longer, critical thinking-based team challenge questions on ocean-related topics. At the end of the long day, it was northern California vs. southern California - Arcadia High School vs. San Francisco's Lowell High School. San Francisco hadn't lost a single round in the double-elimination tournament. So in essence, if Arcadia were going to win, they'd have to beat their northern competitors twice, which is exactly what they did to not only win, but also defend their regional title. "Since we won here last year, we were really looking forward to this weekend and retaining our title," said Arcadia captain Kathy Lee. "Most of our team from last year graduated, so this was mostly a new team and we were really eager to show that we could defend the regional title. And now we're looking forward to defending the national in Seattle, which we won last year." Taking third place in the competition was Santa Monica High School, while Woodbridge High School won the Good Sportsmanship Award. The competition was developed to foster the next generation of marine scientists, researchers and environmental advocates. The National Ocean Sciences Bowl is a program of the nonprofit Consortium for Oceanographic Research and Education, based in Washington, D.C.
Prizes consist of trips to Catalina Island to visit the Wrigley Marine Science Center, part of USC's Wrigley Institute for Environmental Studies. 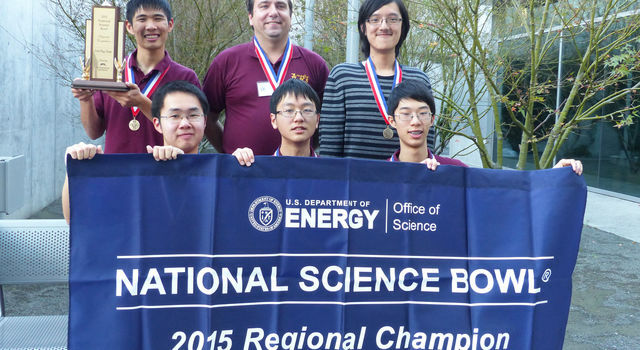 University High School of Irvine, Calif., beat out 23 other local high schools in an all-day, "buzzer-beater"-style Science Bowl held at NASA's Jet Propulsion Laboratory. They came from many areas of Southern California -- from Palm Desert to Santa Barbara, from Irvine to Pasadena -- 24 teams of five students -- to compete in the 22nd annual JPL-sponsored Regional Science Bowl, a "Jeopardy"-style competition. The event was held over eight hours on Feb. 1 at NASA's Jet Propulsion Laboratory, Pasadena, Calif. But at the end of the long day, only one team survived the double-elimination-style tournament: University High School from Irvine, Calif.
"We started this process in July," said University captain Jiho Park. "So it's the culmination of all our efforts since last summer, practicing as much as four or five hours a week as the competition got closer." Jiho was in the same position last year, as they won the regional but then only placed fourth in the national. This time, he said, they hoped to go all the way. Coordinated by the Department of Energy, the National Science Bowl quizzes students on biology, chemistry, physics, mathematics, and Earth and space sciences. The competition, which attracts about 20,000 middle and high school students nationwide, is designed to inspire students to pursue a career in science or math. The program clearly works. When Jiho Park graduates University High School, he hopes to attend Stanford University in Palo Alto, Calif., and study biochemistry. From there, he says he'll get a Ph.D and work on research and development of drugs to fight cancer. The University High School team will receive an all-expense-paid trip to Washington, to compete in the National Science Bowl on April 24 to 28. Other prizes included a trophy, medals, winner's banner and NASA gear. The runner up, Arcadia High School, also received medals and NASA gear. The sportsmanship award went to San Dimas High School for their exceptional graciousness with other teams and competition officials, spirit of fair play and enthusiasm for science. They were awarded a trip to Catalina Island to visit the Wrigley Marine Science Center, part of USC's Wrigley Institute for Environmental Studies. 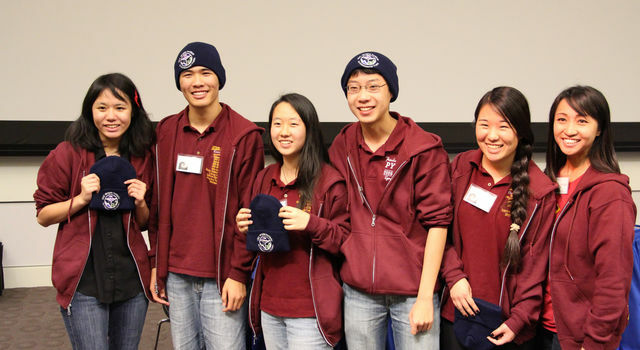 University High School of Irvine buzzed their way to victory on Saturday, Feb. 2, in the Los Angeles regional round of the National Science Bowl competition at NASA's Jet Propulsion Laboratory, Pasadena, Calif. Battling through questions about Saturn's moon Mimas, parallel-plate capacitors and hydrogen bonding in organic molecules, University earned 80 points in the final match against the second place team, Arcadia High School, which scored 24 points. Santa Monica High School placed third out of the 24 teams from Los Angeles, Orange and Santa Barbara counties that gathered at JPL on Feb. 2. The sportsmanship award went to Maranatha High School of Pasadena for their exceptional graciousness with other teams and competition officials, spirit of fair play and enthusiasm for science. Coordinated by the Department of Energy, the National Science Bowl quizzes students on biology, chemistry, physics, mathematics, and Earth and space sciences. The competition, which attracts about 20,000 middle and high school students nationwide, is designed to inspire students to pursue a career in science or math. 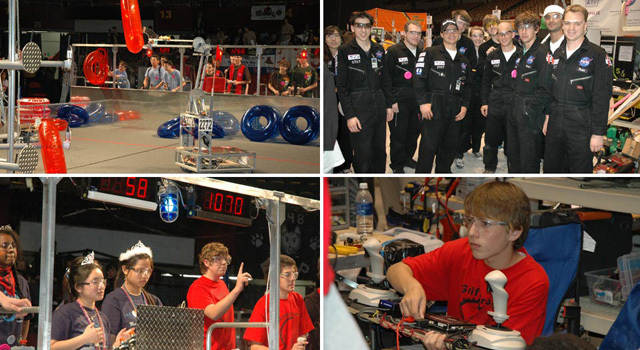 The JPL regional high school competition has been in existence for 21 years. 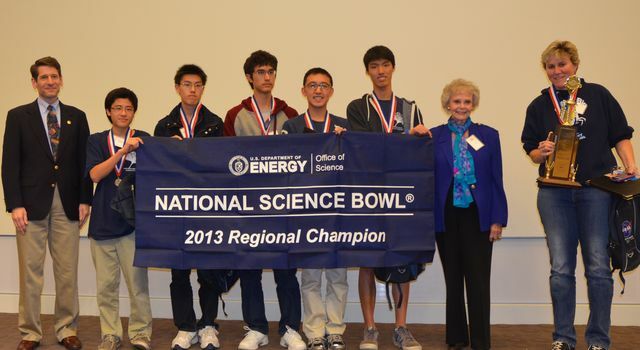 The main prize for the winners of the regional competition is an all-expense-paid trip to Washington, D.C., to compete in the National Science Bowl on April 25 to 29, 2013. Other prizes for University High School included a trophy, medals, winner's banner, a NASA backpack, calendars with space images and a toy version of NASA's Mars Curiosity rover. The main prize for the sportsmanship award winners is a trip to Catalina Island to visit the Wrigley Marine Science Center, part of USC's Wrigley Institute for Environmental Studies. Sixty-four high school teams will compete in the 20th season of the Los Angeles regional FIRST (For Inspiration and Recognition of Science and Technology) Robotics competition. The competition will be held Friday, March 25 and Sat., March 26, at the Long Beach Convention Center. This year's "Logo Motion" game consists of two competing teams, with three robots each, on a flat, 8.2-by-16.5 meter (27-by-54-foot) field. The teams earn points by hanging as many plastic shapes (triangles, circles and squares), on their scoring grid, in a two-minute-and-15-second match. The higher the teams hang their game pieces on their scoring grid, the more points their teams receive. The robots can also deploy mini-bots to climb vertical poles for a chance to earn additional points. Students have six weeks to design, build, program and test their robots to meet the season’s engineering challenge. These young inventors create a robot – with the help of engineers from NASA's Jet Propulsion Laboratory in Pasadena, Calif., aerospace and other companies and higher-education institutions. They participate in competitions that measure the effectiveness of each robot, the power of collaboration and the determination of students. JPL is sponsoring 11 robotics teams. These students are among the 51,000 students in more than 2,000 teams from around the world vying to compete in the FIRST championships April 27 to 30 in St. Louis, Mo. The FIRST Robotics competition is part of NASA's Robotics Alliance Project, which aims to expand the number of robotics systems experts available to NASA. More information and a short video about FIRST is at: http://www.usfirst.org/.